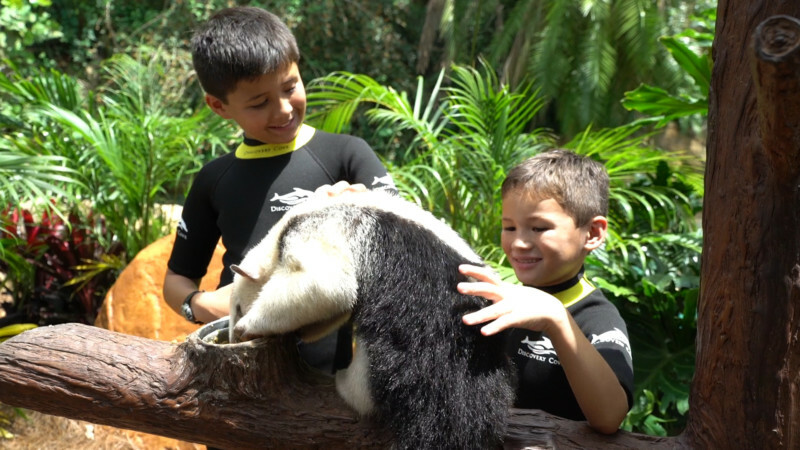 Discovery Cove introduces new Relaxation Massages and a new Animal Trek program that gives guests the chance to explore behind the scenes and get to know Discovery Cove’s animal residents even better, adding to the level of adventure. Both new programs have debuted just in time for the summer travel season. Guests of the new Oasis Spa enter a special spa cabana that overlooks the peaceful waters of the park’s Freshwater Oasis and indulge in a 25-minute massage performed by a licensed therapist. The sounds of nature add to the experience, and solo and couple’s massages are available to guests ages 18 and older. Spa sessions are available from 9 a.m. to 5 p.m. daily and are scheduled on a first-come, first-served basis as guests arrive at the park each morning. A 25-minute session starts at $59, but guests can reserve-back-to-back slots and upgrade to a 50-minute session if they prefer. Massages are done with a special jojoba oil that has a similar pH to human skin and is non-allergenic. The jojoba oil is also animal-friendly, which is essential at a park where the animal inhabitants greatly outnumber their human guests.